Sat., Feb. 2, 2019, 6:40 p.m.
SAN JOSE, Calif. – Sebastian Lletget headed the ball down and the emotions overtook as soon as the ball went into the net. In the same stadium where he scored his first international goal before a devastating foot injury he feared might have ended his career, Lletget delivered a much happier highlight in front of family and friends who made the short drive down from his native San Francisco. Lletget scored and assisted in his first game back at Avaya Stadium since the injury, leading the United States over Costa Rica 2-0 in an exhibition Saturday that made Gregg Berhalter just the third coach to win his first two matches with the American national team. The 26-year-old midfielder entered in the second half, scored in the 80th minute off a cross from Jonathan Lewis, then fed Paul Arriola for the second goal in the 88th minute. Both international goals by Lletget were scored less than an hour drive from where he grew up. He put the U.S. ahead of Honduras in the fifth minute of a World Cup qualifier at Avaya on March 24, 2017, then sustained a Lisfranc injury to his left foot 10 minutes later on a slide tackle that earned defender Ever Alvarado a yellow card. Lletget needed surgery and did not return to the field for the LA Galaxy until the following March 4. He did not appear again for the national team until last Nov. 15. Berhalter began with a 3-0 win over Panama last weekend and joined Bob Bradley (2007) and Robert Millar (1930) as the only coaches to win their first two U.S. matches. Berhalter was hired in December after the U.S. went more than a year without a full-time coach following the failure to qualify for the 2018 World Cup. Bruce Arena quit after the loss at Trinidad in the final qualifier, and Dave Sarachan took over as the interim coach. The 45-year-old Berhalter was a member of the 2002 and ‘06 World Cup teams and became the first American to coach the national team after playing for it at the World Cup. Sixteen players from Major League Soccer started in a match that drew just 13,656. Because the game was not on a FIFA international date, the entire U.S. roster was from MLS. Berhalter will have his full player pool for the first time for matches against Ecuador on March 21 at Orlando, Florida, and Chile five days later at Houston. After a mostly lackluster first half, Nick Lima hit the post from inside the box in the 54th and Roldan struck a post from outside the box in the 68th as the U.S. started creating chances. Lletget entered in the 63rd minute and broke through after Wil Trapp sent a long pass to Jonathan Lewis, who settled the ball and then sent a cross through the box that Lletget headed down. Trapp was inserted in the starting lineup in place of former captain Michael Bradley, one of two U.S. changes. Arriola took over from Jeremy Ebobisse. 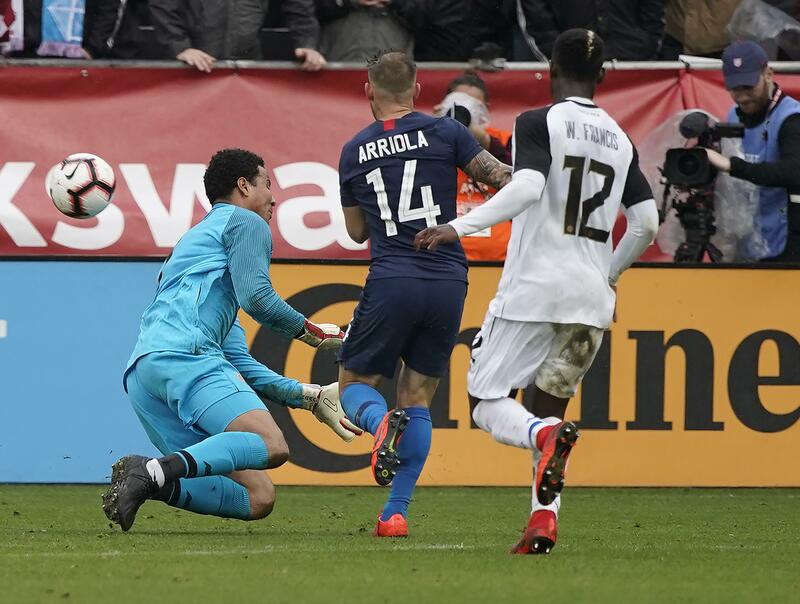 The Americans put the game away when Lletget took a kick from goalkeeper Zack Steffen near midfield and then sent a pass to Arriola, who beat goalkeeper Esteban Alvarado to the ball and chipped it in before taking a tumble. Berhalter used a relatively untried roster, with only Arriola, Trapp and Gyasi Zardes having appeared for the national team at least 10 times in their careers. Costa Rica also had an inexperienced roster in coach Gustavo Matosas’ first game on the bench, with only Alvarado, defender Francisco Calvo and midfielder David Guzman having more than six appearances. Los Ticos had seven players make their national team debuts, including five starters: defenders Pablo Arboine and Keysher Fuller; and midfielders Jose Alfaro, Ronaldo Araya and Marvin Loria. A pair of forwards debuted in the second half: Alberth Villalobos in the 56th and Jean Scott in the 58th. Published: Feb. 2, 2019, 6:40 p.m.